Photographer Philippe Ruault has sent us his photographs of the newly-completed 100 11th Avenue by French architect Jean Nouvel, an apartment block in Chelsea, New York, with every glass panel of the curtain wall tilted at a different angle. The project features over 1,650 different window panes across its curved surface. More information in our earlier stories here and here. See all our stories about Jean Nouvel in our special category. All photographs are by Philippe Ruault. In 1987, maverick French architect Jean Nouvel burst onto the international scene with a new headquarters for the Arab World Institute in Paris, one of President François Mitterrand’s Grands Projets. With mechanized oculi and veils of glass and steel, the building was hailed as an unconventional masterpiece that encouraged people to not only accept modern architecture in a historic setting, but to be thrilled by it. Over ensuing years Nouvel has woven art, history, cultural references and new building technologies into provocative architectural contrasts between inside and outside, intimacy and the urban network, and has become renowned as one of the most original designers of his generation. In conjunction with the 20th anniversary of the opening of the Arab World Institute, construction has begun in New York City on Nouvel’s latest glass and steel landmark, a direct material and conceptual descendant of his Paris tour de force: 100 11th will be a 23-story tower described by its architect as “a vision machine” at the intersection of 19th Street and the West Side Highway, along the Hudson River in Manhattan. The building's gently curving curtain wall of different sized panes of colorless glass - each set in a unique angle and torque - will sheath one of the most meticulously customized, high performance residential addresses in the nation. 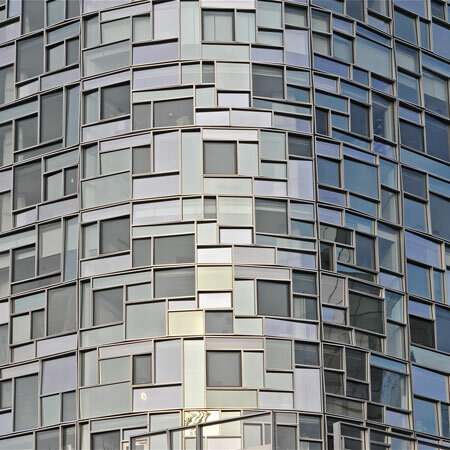 This dazzling window pattern will frame splendid views from within the tower while producing an exterior texture that serves as a poetic analog for the vibrancy, density and changeability of New York City. Nouvel describes 100 11th as “a vision machine,” with every angle and structural detail designed to create visual excitement. Approximately 1,650 different windowpanes comprise the most highly engineered and complex curtain wall ever constructed in New York City. The curtain wall of 100 11th captures daylight differently over the course of the day and the year. A surface that seems to brighten and go dark as if by computer program is, in fact,made dynamic by the movement of the Earth. These daily and seasonal changes will heighten your senses and foster a connection to nature.